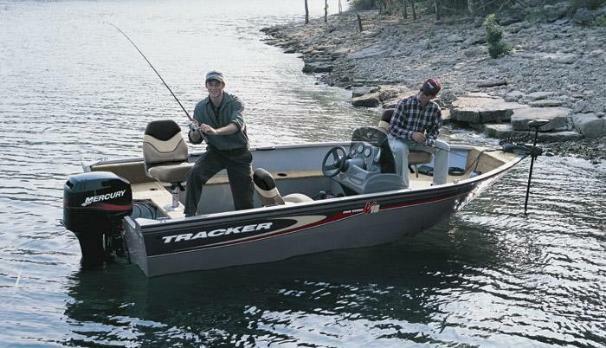 Boat Description Easy to own, tow, launch and store, the Pro Guide V-16 single console model is ready to fish. Ideal for the fishing family looking for big boat performance, the Deep V hull provides superior stability plus exceptional floor space and storage. The layout features fore and aft raised casting decks, three movable fishing seats with six flexible seat positions and a sleek console with windscreen and storage tray. The package includes Mercury Pro Series outboard, 23-gallon livewell with baitwell insert and custom trailer with EZ lube hubs and GalvaShield protection. Add the factory installed fishing package and receive a fish finder, foot-controlled trolling motor and trolling battery. Dry Weight 1194 lb approx.